UK: Statoil's floating 30MW Hywind Scotland project has been granted a marine licence by the Scottish Government, allowing the developer to give the go-ahead for the project. The project will consist of five 6MW turbines, installed 25km off the Scottish east coast in water depths of 95-120 metres. "Statoil's objective with developing this pilot park is to demonstrate a commercial, utility-scale floating wind solution, to further increase the global market potential," said Statoil vice president Irene Rummelhoff. As a result of the government approval, Statoil has made the final investment decision for the project to be built. The Hywind floating foundation is a spar-based design, made up of a steel cylinder filled with ballast. It extends 100 metres below the surface and is attached to the seabed by a three-point mooring. 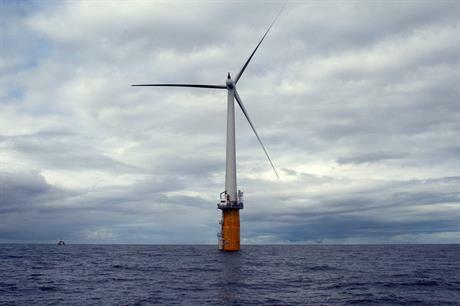 In May, Hywind Scotland project manager Torgeir Nakken said a final investment decision could be expected once the project had obtained onshore and offshore planning consents. In July 2014, Statoil and ORE Catapult challenged the wind sector to suggest ways to help install the spar foundations. Three designs, including one from UK engineering firm Atkins, were shortlisted in August 2014 to be taken forward.